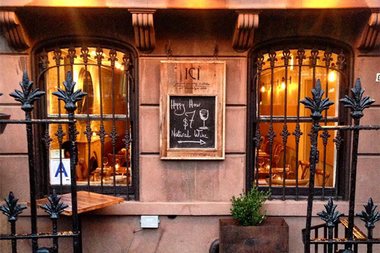 ICI Restaurant, at 246 Dekalb Ave., will now be known as Maison May and will be expanding with a second location around the block at 270 Vanderbilt Ave.
CLINTON HILL — Clinton Hill’s ICI Restaurant is going through a transformation. Local restaurateur Catherine May is expanding her farm-to-table restaurant, which will now be known as Maison May, with a new location at 270 Vanderbilt Ave., the former home of Baguetteaboutit. The current location, at 246 Dekalb Ave., will now be known as Maison May Dekalb, and the new location will be known as Maison May Vanderbilt. For May, the decision to rebrand was deeply personal, according to a letter posted on the restaurant’s website. May, who opened ICI in 2004 with her ex-husband, said she had a “terribly complicated and ambivalent relationship” with the business following a painful divorce in 2008, but she needed to keep the business afloat to sustain her and her children. The name Maison May symbolizes the feeling of home and includes her name and the name of her birth month, according to May. The restaurateur said she wants to share this feeling of home with her customers at the new Maison May Vanderbilt. “It will be an incredibly bright cafe, during the day, a quaint room for private dinners in the evenings, and many more things that you will need to come and discover for yourself,” May said. The new eatery will serve mostly soups, salads and tartines, and has already been approved for a liquor license by Community Board 2’s Health, Environment and Social Services Committee. Maison May Vanderbilt will seat 36 customers inside and 12 customers outside at a sidewalk cafe that was approved by CB 2’s Transportation and Public Safety Committee on Tuesday. The restaurant will operate between 8 a.m. and 6 p.m., but may stay open until midnight for events like parties or weddings. Maison May Vanderbilt will open its doors Saturday, and May says it’ll take just one person feeling at home to make it a success. “If only one person shows up on the first day at Maison May Vanderbilt and they feel at home, then it will be complete,” May said.